Transylvanian Travel, Tours on trips to Transylvania! 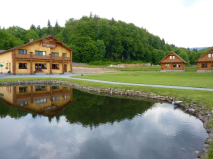 Reserve accomodation, and discover the beauties of Transylvania! You are welcomed in our regions! • Horse-cart ride - Watching a live cheese production! • Szekler Equestrian Festival! • Observe the Brown bear in the wild! • Making the special sekler cake, and folk dances! • Quad Adventure Tour! • Country-cross on Segway! • Sleigh-ride at the top of Hargita mountain! • Mountain tours with snowmobile! • Dog sled tour on Harghita!